One of my favorite things I like to do is browse other teachers' classrooms! In person, or online, it's all the same to me! I just love to do it! 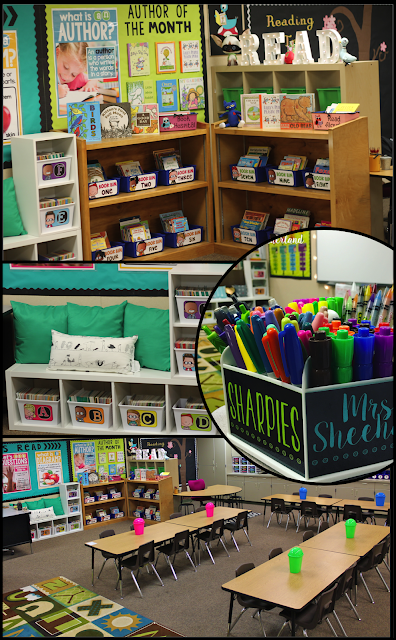 I'm linking up with Ashley and Angie for #2getherwearebetter and with Blog Hoppin' for a classroom reveal- Melonheadz style! Last year I went with a woodland theme and this year I went with a kidlette theme. I'm loving our classroom and most importantly, the kids are loving our room! Let's start with a view from the entry way. If you were to walk into my room, this is what you would see. Let's zoom to north wall and take a peek at my library. I redid my bin labels to help my kids put their books back where they belong. I love these bookshelves so much! My bestie passed them on to me when she moved to a different school. I love to display books by our author of the month on the top ledge. This year I redid my author of the month wall. First of all I cut out my title using my Cricut. I then added a large poster from A Year of Many Firsts. The books I'm displaying on the wall, are the actual books! I just stuck some push pins into the wall and displayed the actual books we are reading. If you take a look to the side you see pigeon holding a book by our author of the month :-) I switch his book out each month. To learn more about how this works, click HERE. I'll zoom out again to view the entire library area. This is one of my favorite new additions to our classroom! I went to Ikea and picked up two of these bookcases. I turned the long one on it's side to create this reading bench! The pillows also came from Ikea. I then picked up these white buckets from The Dollar Tree and stuck some labels on them. My kids get so excited to read on the special bench! Let's talk some more about these posters! Everyone that walks into my room points them out right away. I wanted posters that I could refer to all the time and that would be large enough for my kids to see from any angle in the room. Mission accomplished! I added a title, some chevron accents created with my Cricut, and some flower pom pons and I was good to go! If you look at the top of the last picture you will see my READ marquee letters. It only took driving around to 6 different Joann's to find that letter A. They add so much to my library. The best thing about them is that they are battery powered so I don't have to deal with any cords! And this is what they look like when it's dark. We are not supposed to put anything on our cabinets, but I COULD not help myself and used them as my word wall. Here is the rest of the cabinet wall. All the way to the left you will see my student mailboxes. I use these to store student work. Once a week I send home a week's worth of work. So far I'm noticing that more parents are getting to see their child's work this way. In the past I've seen that my kids have work from weeks ago in their backpacks! I was looking for a solution and this seems to have done the trick. I also put a folder at the bottom of each drawer to help me build an ongoing portfolio. Now whenever a last minute meetings pops up, I can pull the portfolio and have lots of student work for the meeting. These will also come in handy for parent conference. Next to the mailboxes you will find my paper trimmer, hold puncher, tape dispenser, and pencil sharpener. It's my little command center. Next you will find more kidlettes :-) The small tower holds my commonly used items. The toolbox holds items that would typically be found in a desk and on the far right you see my weekly drawers. In the weekly drawers I like to store my copies for the week. Whenever I don't have time to get to something, I place it in the sub bin so that I don't have to make copies for a sub. Do you see my awesome lamps? I found them last year at Walmart. Here you see the right side of the countertop. There is something so beautiful about seeing a whole row of book bins! I just wish they were black! My students use them during read to self time. All the way at the end of the row of book bins is where I keep my subject drawer bin. In this bin I keep my copies that I make ahead of time and organize them by subject. That way I can copy a few weeks ahead of time and have a place to keep all those copies until I'm ready to move them to my current week's bin. 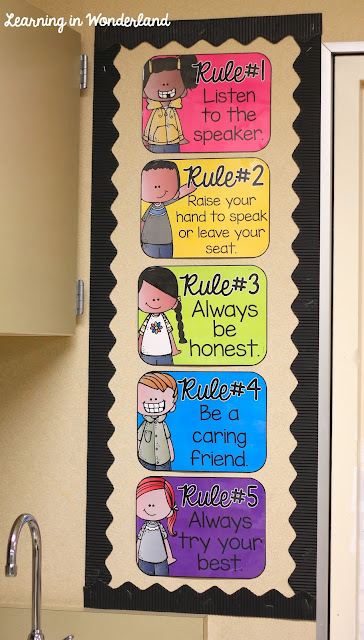 I'm not one to waste space, so I put up my classroom rules right by the door. It's a great way to review the rules every day when we are getting in line and it's located by my clip chart. From my desk looking forward. From here you can see my whiteboard and more displays. To the far right you can see my student display board. I got this chalkboard paper from Joann's and hot glued some pink bows onto clothespins. The clothes pins were just clipped onto the paper. On the small board to the left is our Instagram photo display. I'm planning on putting my student's pictures in the squares! What a creative idea from Ashley! Next to the student work display you will see our objectives board. We are required to always display our objectives. Last year I displayed them using scrapbook paper. After I saw the way that A Cupcake for the Teacher displayed my headers and Debbie Crocket's posters, I decided to make the switch to rings. I put my week's objectives on the rings and all I have to do is flip them throughout the week to find the day's objectives. You can see a video of that below the next picture. Above my objectives you can see this beautiful alphabet by Ladybug's Teacher Files! I love the brights on black! All the way to the left side of the wall is where I placed our clip chart. The title was created with my Cricut. A view from my desk to the entry way. A view from the north wall to the entry way. Another angle of my west wall. This is where my Smartboard is located. This amazing carpet was also given to me by my bestie. I picked up those little stars around the board from Target. Looking over to the left of the Smartboard you can see the grammar wall. I am loving these banners by Amy Groesbeck. They add a little something to my bulletin boards! So that is a peek at my room! Have you linked up for #2getherwearebetter and Blog Hoppin'? 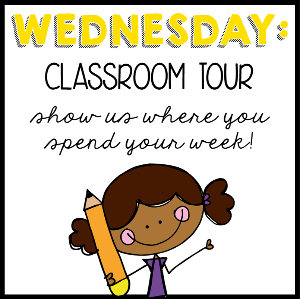 Make sure to check out all the awesome classrooms today and link up your own reveal! Beautiful Room! All your work looks remarkable displayed! AND Lyndsey's Posters blown up are amazing!!! You rock girlie! Your room looks amazing! 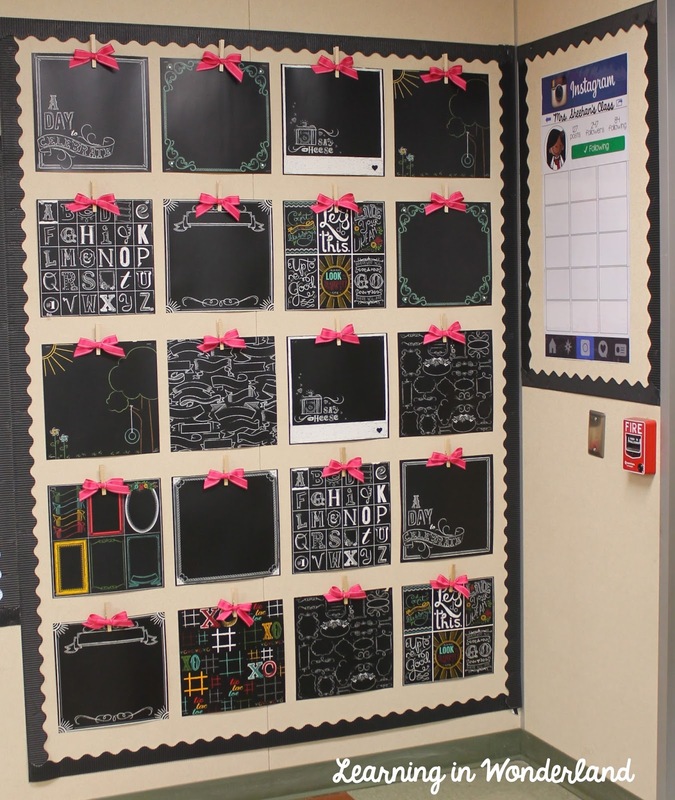 I really like the idea, with having the chalkboard paper with the students pictures pinned on it. It will look really cute. What an awesome space! Your room is HUGE! And it looks so cute. I use a bunch of your woodland animal-themed products in mine :) I'm a huge fan! Looks gorgeous! I really like the Ikea reading bench and the kidlettes everywhere! You've inspired me to redo my schedule cards! Mine are boring. Have a great week! Great room! Love how clean and simple it is! I especially like your reading area and student mailboxes!! Adorable!! This room is AMAZING! How luck are your kids! I love everything you create! Thanks for sharing! So many things to comment on! Love the owl lamps, the large posters, the mailbox labels....all of it! Well done! I will definitely be saving some links from you. Thank you so much for sharing your classroom. It's a breath of fresh air-- bright, colorful, and clutter-free! Your students are so lucky to learn from you! I now want to go rearrange my room to look exactly like yours! I love the book bins and how you just put numbers on them! Do you have them grouped by theme or just all different books in each bin? Mine are labeled but the kids still have a hard time putting them back in the right place. :( I feel like that might alleviate some of those problems. It's a very clean and organized room, which I love!! I also love that you live in the area I do!! I work in the Phoenix area, though this only my first year. I just recently found your products looking for fun Grammar Wall Headers and I have fallen in love!! Thank you Sam! So happy to hear that you love them! Love your room! How did you print the posters? Hi Leslie :-) I took the PDF over to Office Max and they printed it poster size. 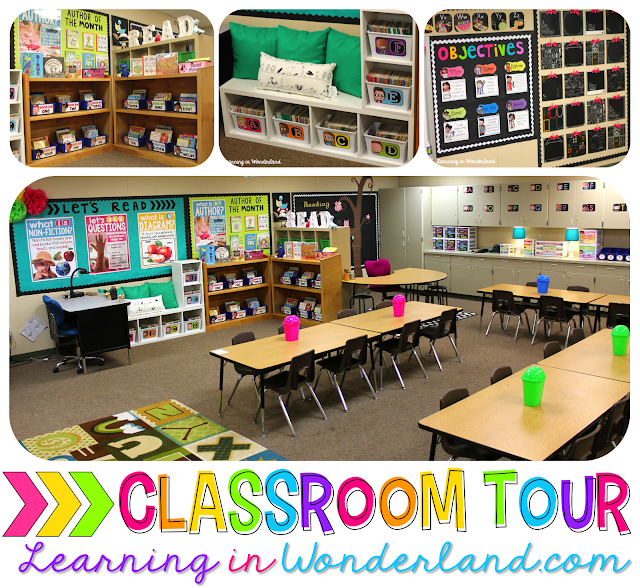 I love your classroom--it is absolutely beautiful and looks like a fun and organized place to learn! I have a question: Where did you get your green bulletin board paper? I like that it seems to be a yellowed lime which would match my bins. All the lime greens I have found are not quite it, and I'm a little fanatical about color, lol. Hello! I got it from Amazon :-) Here's my affiliate link if you are interested: http://amzn.to/1QcwODb The color is a nice bright lime color! Hello. Awesome room. I LOVE the posters so I followed the link. I teach Kindergarten and would not be able to use the curriculum piece. Do you sell just the posters? I would love to buy them from you. Thanks. Can you tell me which bookshelves you bought at IKEA? I Love Everything! Where did you get your best practices posters for math?? Hello, love your classroom! Did I miss it or did you provide a link to the math practices posters? Best looking classroom I have seen in awhile! So organized and neat! I love the letters on the bulletin board. Did you buy those or make them? Also the blue bins with the # on them, where did you get those? Thanks! I love your classroom! What do you use the mini trash cans for on the tables? Hi! I am a first year kinder teacher!!! I, absolutely, love your room!!! What grade do u teach?! 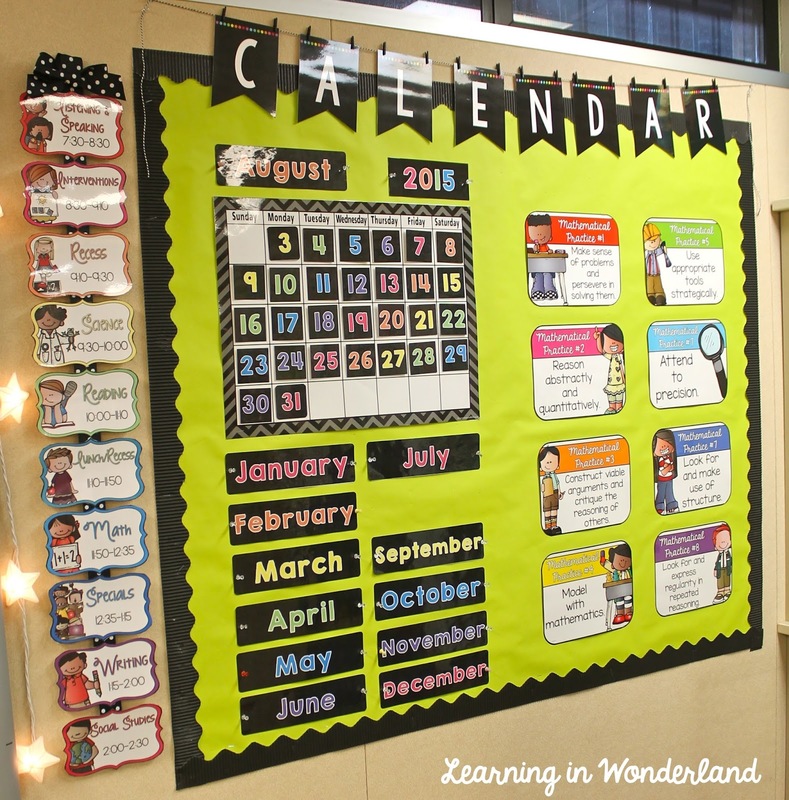 Do you feel like a lot of the stuff you have in your classroom could work for Kindergarten? Your classroom is amazing! Thank you for sharing! Hi there! Love it! 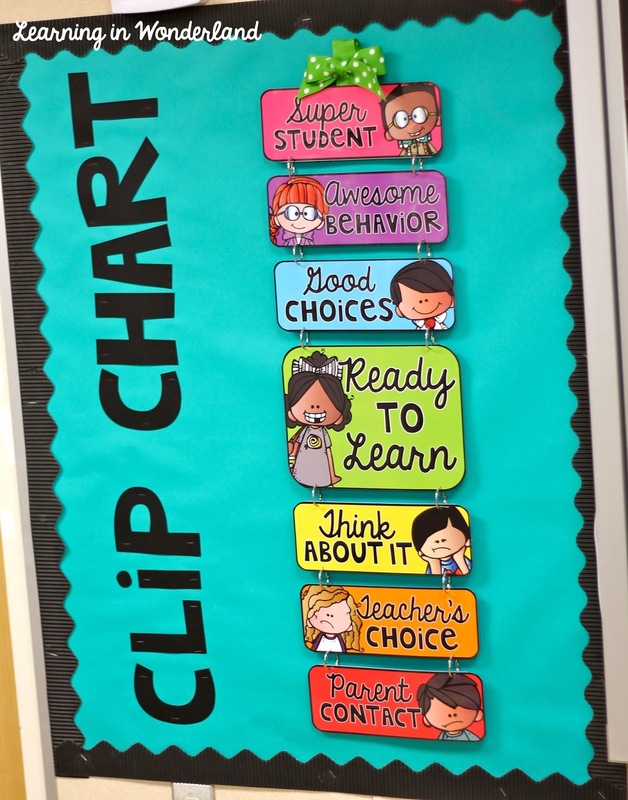 Your OBJECTIVES, CLIP CHART letters. Where did you get these and what are they called? Thank you!! Not sure if anyone has asked you this yet... but do you laminate your book bin labels? Mine are laminated and I cannot for the life of me get them to stay glued to my book bins! What do you use at the top of your clip chart? I love the bow, but what is holding it in place? Also, did you use a hole punch before putting the binder rings on the chart?? I'm curious how your IKEA bookshelves have held up. I'd like to do something similar to your bench but it would have to be out of my own pocket so I want to make sure if I spend the money that they will last. Where do you find the clip art to make your name tags for the plastic containers for each student? Love your classroom! Your room is beautiful. With your book bins are they organized by levels? Do you put a letter or number on each of your books so the students know where to put them back? Love your classroom!! where did you get your abc carpet? I love your classroom! I'm using the Melonheadz theme this yr as well. What font did you use on your book bin labels to create the book background around the letters? Would you mind sharing what size you enlarged the posters to and where you printed them from? Thanks!! 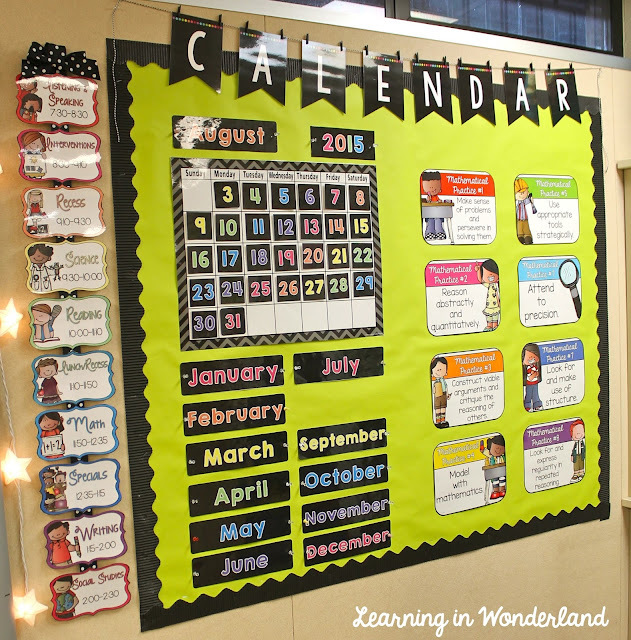 How do you do your bulletin board headers (let's read, objectives, etc). 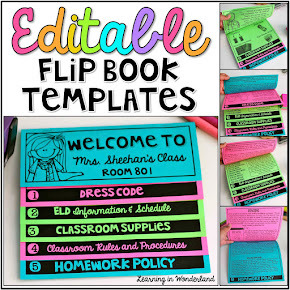 I love the font and how the letters are so big...do you have a tpt editable file for those or could you assist! I'd love to make some headers for my math board and such! I love your vibrant room! I am looking to better organize our library area. Where did you get the bins for your books?